Announced at a March 2018 Apple event so heavily focussed on education it was held in an actual school, the iPad is nonetheless, iPad 9.7-inch 2018. Far from being scaled down to make it cheaper for schools, it actually adds some features previously found only in its 'Pro' big brothers. Yes, it's being pushed at launch as an inexpensive platform for school kids, students and teachers to access the "200,000" education-focussed iOS apps available. But it is actually this year's new iPad for grown-ups, too. The new iPad has a 9.7-inch Retina Screen that is compatible with Apple Pencil thanks to a higher-resolution touch sensor. 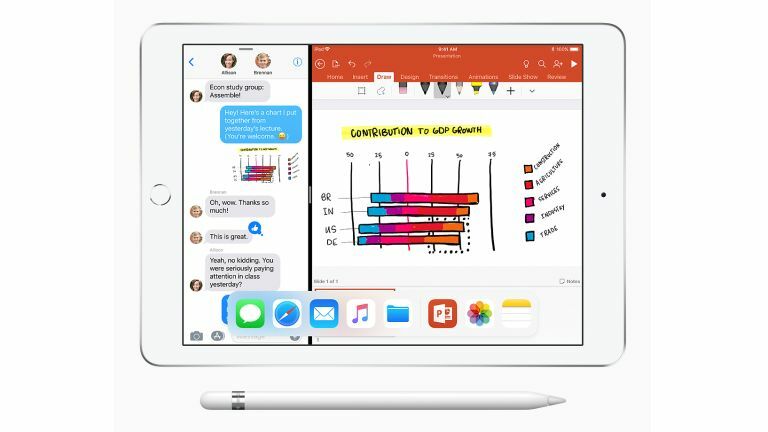 Apple's own productivity apps – Pages, Numbers, and Keynote – have been updated accordingly. Annotations made with Pencil are stored specifically as an addition to the paragraph they're annotating. So that's nice. Another former iPad Pro-only feature carried over is its advanced tilt and pressure sensing. More standard spec details: 10 hours battery, 9.7-inch, 2048x1536-pixel, 264 ppi screen. 8-megapixel/1080p front camera, 1.2-meg/720p front 'FaceTime' camera. The new iPad runs on Apple's 64-bit, quadcore, A10 Fusion chip. This is a slightly more powerful version of the A10 that powered the last iPad. You can have either 32GB or 128GB and either Wi-Fi connectivity only, or 4G and Wi-Fi. Unlocking is via Touch ID fingerprint reading, rather than facial recognition. Weight is about 450g, so young arms may lift it. A lot of the focus at launch, education and creativity aside, was on augmented reality, which the A10 Fusion chip is supposedly engineered to be especially adept with. iPad 2018 is the 6th generation of the iPad fam, so T3's Matt Bolton informs me, and comes in silver, space grey or a 'new' gold finish that looks rather like the old gold finish. • Pricing: £319 for the 32GB Wi-Fi model, £449 for 32GB Wi-Fi + 4G, £409 for 128GB and Wi-Fi, £539 for the full English. Apple Pencil is an additional £89. Those concerned abut 'rip-off Britain' will be pleased to know that in the States it's $329 (that's about £233 – ouch), and $299 for educational establishments. It will also be cheaper to UK schools, but no £ price has been announced as yet. That's cheaper than the expected price of Acer's Chrome OS educational tablet announced this morning. The new iPad starts shipping this week. Students also get a bumped-up 200GB of free iCloud storage, for storing all their course notes and photos of the pop stars Taylor Swift and, um, Kylie. All the modern young peoples' music. Up to now, Apple said at the launch, "The most popular iPad has been the [older] 9.7-inch iPad," which was $299 to education establishments taking advantage of Apple's education discount. Apple is clearly serious about taking on Google's Chromebook dominance of the US education market, but does it have too much of a head-start? Perhaps that doesn't matter – it's also a very solid addition to the consumer iPad line-up, even if you do need to pay more for it than your local school does. • Pre-orders start today, with shipping later this week in the UK and 24 other countries.